Meet Cake + Pie Creative, the decor8 blog of the week! Kathleen and I had a chat about her blog, so if you'd like to join us, continue reading below. 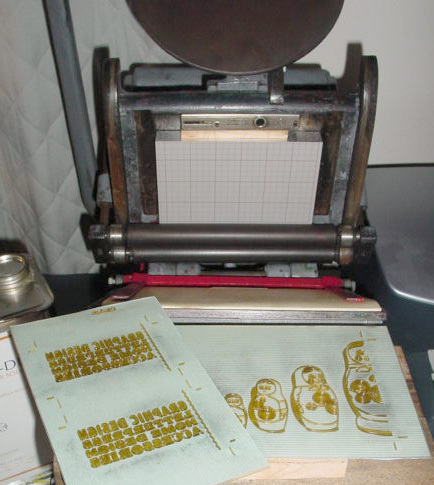 If you have questions for Kathleen about letterpress, graphic design, etc. please post them in the comments section and Kathleen will answer them for you. Okay, here we go peeps.... Introducing (drum roll please), Cake + Pie Creative! decor8: As blog of the week, decor8 readers would love to get to know the girl behind the blog. So Kathleen, can you give us a mini bio? kathleen: Sure, my name is Kathleen Losche, and I am a 26-year-old freelance graphic designer (mostly corporate work recently). I studied graphic design at the Rhode Island School of Design (RISD), and graduated in 2002. I live in Franklin, TN, (south of Nashville,) with my boyfriend of 7 years, Aaron Durnin, and I work out of my home studio in Franklin. Aaron and I met while we were at RISD, where he studied furniture design. decor8: Woo-hoo, a fellow southern girl (I grew up in South Carolina)! Are you a true southerner though, or a transplant? kathleen: Total transplant! I moved here at the end of January, but Franklin is Aaron?s hometown. I'm originally from North Bellmore, Long Island. I loved growing up there -- good shopping, close to the beach, and just a train ride to Manhattan. When I graduated from RISD I moved back thinking 'who wouldn?t want to be in New York?!' But as it turns out, I didn't want to be there anymore. I really like where I'm at now - I'm minutes from a drive through the country and near to many fabulous little antique stores. I?ve found that being down south gives me more time to breathe and take things in, so here I am. kathleen: There was always a lot to see growing up near NYC, many times something unexpected. I love architecture and color and looking at things up close so I can see layers and texture. How I grew up also influenced how I design. I have very supportive and encouraging parents, and in high school I had two really amazing art teachers who became great friends and mentors. They really shaped how I approach everything I make, probably more so than any professor I had in college. decor8: Let's talk about your blog, Cake + Pie Creative. How did you come up with that cute name? kathleen: Well, cake + pie creative is the name of my design business. Choosing a name was an arduous process. I spent about three months brainstorming and going through lists of words, but nothing sounded right. I had a bit of downtime over the holidays, and my Aunt had given me all the old family cookie recipes, so when I wasn?t trying to think of a business name I was baking. Prior to that my idea of cooking and baking was anything microwaveable, but soon I was trying out pies, cakes, rugglech... I showed up with dessert everywhere I went. The name cake + pie came to fruition after I baked a pear pie for New Years. I was jotting down yet another list of possible business names, and after all that baking, cake + pie ended up on the list. I ran it by my family and friends, and a few liked it, but most thought it sounded more like a bakery than a design studio. decor8: Why did you start blogging and what do you like about it? kathleen: My blog launched on June 23, 2006. I had been thinking about starting one for about a year, but when the blog finally happened it was sort of spur of the moment. I'm very glad I finally decided to do a blog because now I feel like I have a forum to talk about things that I find interesting, and the goings on at my fledgling design studio. Having a blog really motivates me to work and find inspiration in things. I find myself looking for things that are ?blog-worthy? to post and it makes me pay attention to things more. decor8: What are you trying to accomplish through your blog? kathleen: I love that there is such a community of artists, designers, and people who love design in the blog world. For now I just hope that I am contributing something worthwhile to that community. If something I post sparks an idea for someone else, or they just get a giggle from something I've posted, I?m happy. I hope that my blog will help get the word out about my work and the launch of my Etsy store, and that it will be a place I can post new work and obtain feedback. decor8: With a bevy of design, art, and crafting blogs out there now, what do you think sets your blog out apart from the others? kathleen: It does seem like there are a lot of people blogging about design and crafts, but what we?re all really talking about is art, and art is a very subjective thing, so I enjoy reading other people?s perspectives. I feel like I learn from other people and hopefully they get something from me too. I think that I have a unique point of view. I don?t consistently blog about just one area of design. I talk about letterpress, sewing, art, design, books I find useful, and things I find or buy that I really love. I also don?t do reviews unless they are of things I own or have experienced... If I say something is good or worthwhile it is because I really believe it is. decor8: How often do you blog? kathleen: I usually spend about an hour at night working on the blog, after I am finished with my freelance work for the day and taken a little break. I always have my most creative moments at night. I am not a morning person. decor8: I noticed that you have an etsy store scheduled to open soon. Can you tell us about what you create and do you do this for a living? 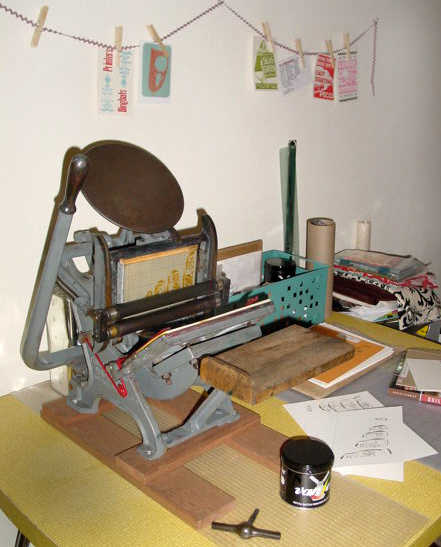 kathleen: I recently purchased a letterpress and a vintage sewing machine, part of a desire to create AWAY from the computer. I did a bit of letterpress in college, so it has been fun getting back into it. The Etsy store will hopefully open by the end of the summer. I plan on selling some of the letterpress cards and prints I?m working on, as well as some sewn accessories. I don?t plan on making my living from it just yet, but if it turned into that I would love it. decor8: How would you describe your design style? kathleen: Hmm? I like things that are clever and that have some sort of subtle twist to them, something unexpected, and always colorful. I love my Pantone books. decor8: Funny you say that, my art teacher in school was my mentor, too. My parents had her come to my house in the evenings 1-2x per week to study art with me. I loved learning how to draw in 2 and 3 point perspective and I loved drawing furniture, especially chairs. Now, back to you Miss Kathleen, tell us, are you living your dream (career wise)? kathleen: I love working for myself but if I had my choice I?d be doing more making stuff and less corporate work. I would also really like get back into painting and ceramics, both of which I?ve always loved, but they seem to have fallen off my radar in the past few years. decor8: Looking ahead, let's say 5 years from now, where do you see yourself? kathleen: Well, Aaron and I celebrated our 7th anniversary in May, so I?d expect sometime in the next five years we?ll get around to walking down the aisle. As far as kids, job, home? I have always been a super planner, but lately I have been trying to resist the urge to have a 5 and 10 year plan, so I think I?d like five years from now to be a surprise. decor8: I already know who will create your wedding invites. :) When you need inspiration, who do you turn to? kathleen: I am inspired by a lot of different artists and designers. Malcolm Grear is one, I had the privilege of interning for him in college. His studio always does consistent strong design that I have learned a lot from. I love looking at work from different letterpress printers from Hatch Show Print (one of the South's oldest letterpress shops) here in Nashville, and Yee Haw Industries in Knoxville, to port2port press, and elum designs. I find inspiration in some of my favorite artists, like Louise Nevelson, Toshiko Takaezu, and Alberto Giacometti. I really like Eleanor Grosch?s work at pushmepullyou design. I first read about her on A Bird in the Hand and I think everything she does is amazing. I also find a lot of inspiration in some of my friends... My college roommate, Caitlin Keegan, is an illustrator, and my friend Yvonne Boogaerts is an artist, designer, and sculptor who is getting into making these great mirrors. Hearing and seeing their work really motivates me. decor8: What are five subjects you'd like to learn more about? decor8: Great picks, Kathleen. Textile design interests me and I know lots of other decor8 readers, too. Now, to wrap up... What are you top ten indulgences? kathleen: Starbucks white mocha lattes, Claus Porto soaps, Bumble & Bumble and Davines/For Wizards hair products, clutch bags, shoes, iTunes, mint chocolate chip ice cream, new art for our apartment, TV, and celebrity gossip. Super! Thank you Kathleen for stopping by to say hello. If you would like to be considered for blog of the week on decor8, please email me at decor8blog [at] yahoo [dot] com. All emails will be answered within 1-3 business days! If there's a question for Kathleen that you have, please ask her by posting the question in the comments box below. Kathleen will answer you herself! Out of the Office... Celebrating!